Knish from Yonah Schimmel's in NYC! 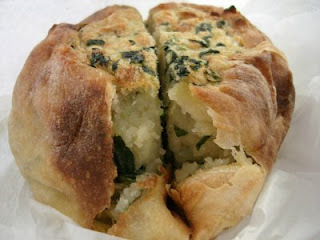 Made from the main ingredient POTATOES--A knish is a small round "pie" with a dough outside, stuffed with filling such as spinach, sweet potato, kasha or mushroom. 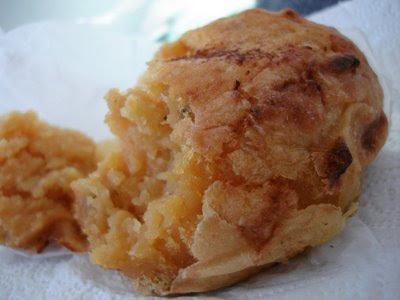 A knish is about the size of a softball and VEGAN--no dairy, eggs or meat (unless specified). Knishes can be bought warm or cold and easily heated up in the microwave or oven. 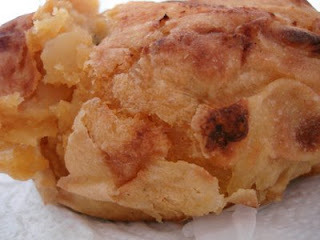 One potato knish (large size) has only 300 calories--and is very filling. 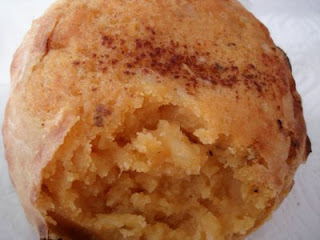 My knish discovery began when I decided to research a curious little store on Houston street in NYC'S LES. I had walked by this quaint little store (right next to Sunshine Movie Theater) literally hundreds of times, but never went inside. What is a knish anyways??? I always asked myself. The window was usually full of plump little knishes-warm from the oven. But still I only scowled at the place and moved on. Until recently I decided to research this store--Yonah Schimmels Knishes-- on yelp.com. The reviews were all very high. And after researching the healthy properties of an all natural potato based knish, I decided I HAD TO TRY THIS PLACE! So first thing Tuesday morning I was excited to see the store was open. I went inside to be greeted by a sweet man at the counter. I asked, are there any flavors that are dairy free? He looked at me curiously..." there are NO butter, eggs, dairy in any knish." Ah perfect!! I was thrilled. I ordered a spinach and a sweet potato knish. $3 each. I got a few beverages too and was very excited. I was shocked at the heavy weight of my tiny bag. I got home, heated a sweet potato knish in the microwave for 90 seconds and it came out warm and fluffy--the microwave really did it well. It smelled delish! Like warm sweet potatoes--like a pot pit, without all the unhealthy stuff!! Live in NYC? Check out the Knishery at 137 e. Houston st. Its been in business since 1910!!! Its $85 including shipping, but trust me--I think it is worth a try. These knishes must be the best around, and if you are going to eat a knish--I am guessing it MUST be fresh and made with the highest quality ingredients--which YONAH SCHIMMEL'S DOES! !